A Houthi militant carries computer components out of the Chamber of Trade and Industry headquarters after it was hit by a Saudi-led air strike in Yemen's capital, Sana'a, Jan. 5, 2016. Drinking tea on his traditional Yemeni low sofa, Sultan Zaied, a 41-year-old accountant in the Yemeni capital, Sana’a, says the diplomatic battle between Saudi Arabia and Iran has already intensified tensions in Yemen, and the crisis is still growing. As countries and militias line up behind regional giants Iran and Saudi Arabia, analysts say the diplomatic crisis is already having an impact across the region. If it continues, they add, Middle East wars — including the fight against Islamic State militants — are more likely to expand than to be resolved peacefully. 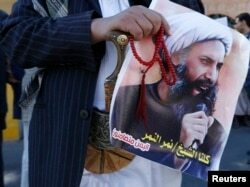 FILE - A Shi'ite protester carries a poster of Sheikh Nimr al-Nimr during a demonstration outside the Saudi embassy in Sanaa, Oct. 18, 2014. “This diplomatic crisis has diminished the prospects for peace in Syria and the same can be said about Yemen,” says Gulf State Analytics founder Giorgio Cafiero, speaking by phone from Oman. Islamic State militants have the most to gain from the crisis, which is spreading the chaos the group thrives on and dividing the region, he adds. Kuwait is the latest Sunni-dominated country to withdraw its ambassador from Iran, following Bahrain, Sudan and the United Arab Emirates, which have all either cut ties or downgraded their relationships with Iran following an international dispute over the execution of Shi'ite cleric Nimr al-Nimr. 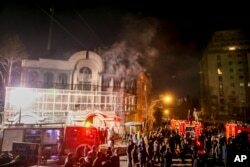 After the execution, the Saudi embassy in Tehran was attacked and Saudi Arabia severed diplomatic ties. Smoke rises as Iranian protesters set fire to the Saudi embassy in Tehran, Sunday, Jan. 3, 2016. 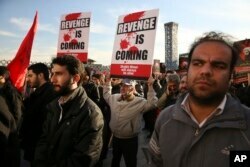 Protesters upset over the execution of a Shiite cleric in Saudi Arabia set fires to the Saudi embassy in Tehran. The regional rift is far deeper than the current dispute, according to Mark Fitzpatrick, executive director of the International Institute for Strategic Studies in the United States. Iranian demonstrators hold anti-Saudi placards in a rally to protest the execution by Saudi Arabia last week of Sheikh Nimr al-Nimr, a prominent opposition Saudi Shiite cleric, in Tehran, Iran, Jan. 4, 2016. If the nuclear agreement between Iran and world powers is implemented, Tehran is expected to be relieved of sanctions, greatly expanding its economic power and ability to fund militias in the region, like Hezbollah in Lebanon and the Houthis in Yemen. But it is not just an economic rivalry, says Fitzpatrick. Additionally, both countries are using the dispute as a power play in domestic politics, says Max Abrahms, a member of the Council on Foreign Relations and political science professor at Northeastern University. Regional wars in Syria, Yemen and Libya are less likely to be solved through peace talks if the major players in the region — and on the battlefields — cannot negotiate, according to Cafiero of Gulf State Analytics. An outright war between the powers may be unlikely, adds Cafiero, but both Saudi Arabia and Iran may increase their involvement in Syria and Yemen, often seen as a fight between two regional giants. “It’s far more likely we will see the two sides wage proxy wars more aggressively,” he says. The sectarian nature of the dispute — regardless of its causes — could deepen divisions in the region, adds Abrahms of Northeastern University. Followers of Shi'ite cleric Muqtada al-Sadr burn an effigy of King Salman of Saudi Arabia as they hold posters of Sheik Nimr al-Nimr during a demonstration in Baghdad, Iraq, Jan. 4, 2016. Angry rhetoric is already fueling the current wars and Shi’ite groups have long vowed revenge in the event of al-Nimr’s execution. Shi’ites across the region have already expressed anger and none of this bodes well for the coming year, according to Abrahms. Almigdad Mojalli contributed to this report from Sana'a.